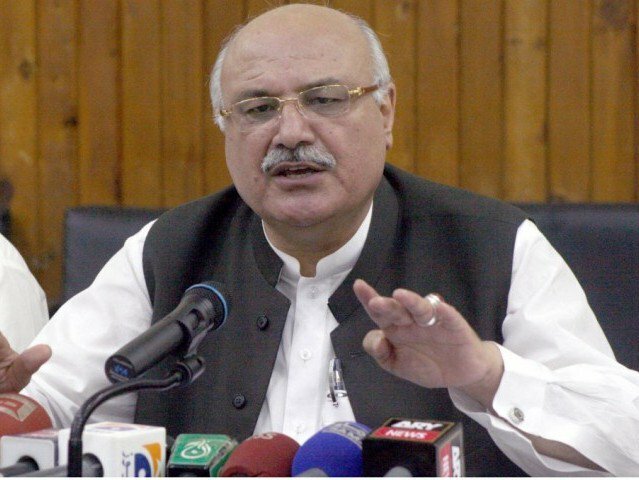 PESHAWAR: Senior politician and ANP general secretary Mian Iftikhar Hussain has received a ‘suicide attack’ threat once again and this time it is reportedly ‘serious’. The threat to his life comes at a time when he himself and his party leaders and workers have announced to take to streets to protest alleged rigging in the elections and demand fair re-elections. Hussain had been information minister in the ANP government in Khyber Pakhtunkhwa during a sensitive time when not only tribal areas but militancy infested Swat, Malakand and other parts of the province. He lost his only son Mian Rashid Hussain in his hometown in a terrorist attack in July 2010. Over the years, Hussain has been receiving threats every now and then, whether in government or having lost elections in 2013. Issuance of such terror alerts have almost become a tradition as before each religious festive occasion like Eid he would get a warning by local authorities to remain vigilant for his safety. Haroon Bilour, the ANP candidate for PK-78, was killed in a suicide attack on a corner meeting of the party on July 10. Despite such threats, Hussain continued to take part in election campaign in his hometown Pabbi in Nowshera but lost the polls. He said that he submitted an application for recounting of votes in the constituency but it was not accepted so far.